Escape from boredom. Get behind the wheel, or the handlebars, and broaden your horizons. But be warned, in this adventure, the choice of vehicle is as important as the route you take. First you need to meet the Belles Echappées team and their extraordinary vehicles. In the beautiful farm of the old abbey, the unexpected strikes you right away. An inner courtyard as big as a football field. Then you need to choose your ride. The indestructible Citroen 2CV? The family VW kombi? Or the Méhari? If you prefer a more eco-friendly option, try the Solex electric bike or the Californian bike. Then comes the choice of route. It has to be off the beaten track and full of surprises. Just follow the GPS or the printed roadbook. And off you go, nose into the wind to explore the Opal Coast, Flanders and Artois. If you’re worried about feeling peckish on route, don’t forget to order your picnic in advance. Then just find a suitable wildflower meadow and park alongside. Latest arrival in the collection of incredible vehicles, try the Calessino! 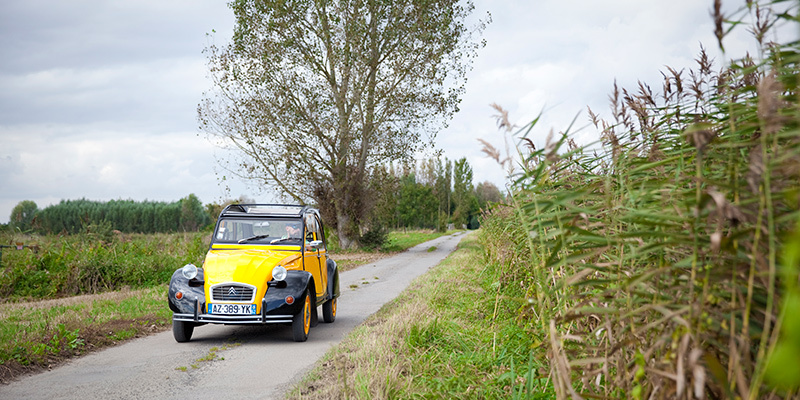 The promise of La Dolce Vita in the Saint-Omer countryside with this 4-seater 3-wheel vehicle, a dash of Vespa style while you enjoy nature.